I was lucky enough to spend most of October in Hawaii on business … and lucky enough to stay in a hotel that was right next to the most amazing little acai joint called Basik Acai (a don’t-miss if you’re in Kona!). 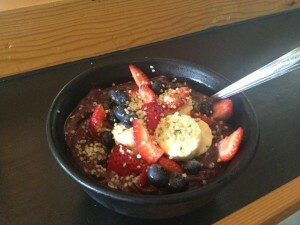 I came home virtually addicted to these nutritional-powerhouse bowls of goodness (Dr. Oz: “Acai is a powerful antioxidant. Colorful dark foods like red wine, pomegranates, concord grapes, blueberries — they call them brain berries — are full of nutrients.”), and since there isn’t an acai bowl source anywhere near my home in Atlanta, I had to figure out how to make them on my own. Luckily, they’re simple if you have a Vitamix, and you can have fun playing around with loads of different ingredients. Frozen unsweetened pulp packets: Whole Foods sells the frozen Sambazon-brand pulp, but I’ve discovered I like Amafruits (which you have to order online) a little better – seems like less water, more fruit. I use 1.5 – 2 packets per bowl, but experiment to see what you like. Liquid: Just about anything you want, but I really like coconut water, coconut milk, homemade cashew milk, and/or greek yogurt. Other frozen fruit: For me, frozen bananas (at least a bit) are a must – they make the texture nice and silky. Mangoes are also nice. Whatever else you want to blend in! I’ve used kale, edible green tea, peanut butter, almonds, cacao nibs, pomegranate, chia, and lots more. Have fun! Spoon this mixture into a bowl, and liberally top with chopped fresh fruits (papaya, banana, blueberries, strawberries … you get the idea). Add texture with a sprinkling of granola, goji berries, crushed almonds, walnuts, unsweetened coconut, and/or flax seeds, etc. Finish with a drizzle of fresh local honey or maple syrup if you like. I don’t normally add sweetener to anything, but Acai pulp is unsweetened, so just a touch of honey or maple syrup really builds the flavor.